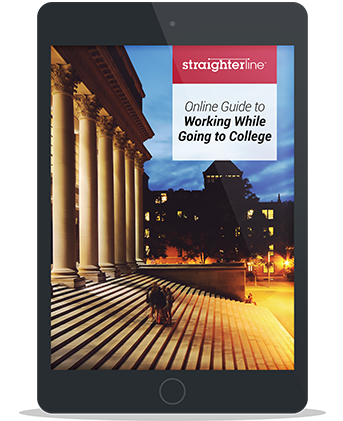 You can now download and enjoy Online Guide to Working While Going to College. Our FREE guide will show you how to successfully fit college into your working life so you can reach your degree goals while growing your career and income. Find out exactly what you should know about working and going to college. Discover how to significantly save on your college degree, manage your time effectively, and increase your success. Discover how to reduce your cost, reduce your risk, and find scholarships for working adults. StraighterLine provides low-cost online courses that are guaranteed to save you money on your degree from schools in our network of nearly 100 accredited colleges.